Robert on the 3 shows: "It's been fun. I know I'm not supposed to say that, but it has." 4th encore: Dressing Up, The Lovecats, Close To Me, Why Can't I Be You?, Boys Don't Cry, Hey You. End of the 3rd and final show of this terrific 3 night stand. Thank you, Cure! You were fantastic! Bravo! Setlist changes: Sleep When I'm Dead, Friday I'm In Love, Doing the Unstuck played for 1st time at this set of shows. alt.end, High, Before Three, Hungry Ghost, Let's Go to Bed not played tonight. Again, huge thank you to JC/Perfect.Murder for going above & beyond for 3 nights in a row. You are a star, my friend! Thank you,thank you,thank you! And thank you to @Snuffybear, @nilsvdlinden, @jason_walton, Julie, and everyone else who helped tonight. I appreciate it so much! 8:05 - Lights are out. 7:59 - @marsworld: Music of Cranes jewel RS mix now! So lovely I met Alison yesterday! 7:58 - Perfect.Murder: Playing some Cocteau Twins and Cranes over PA now. 7:47 - @Emile_MW: PA now playing The Carpenter's 'Yesterday Once More'. 7:07 - Perfect.Murder: PA playing Billy Corgan & Robert's cover of 'To Love Somebody'. For the 3rd night in a row, the wonderful, brilliant, hilarious, and always so helpful JC/Perfect.Murder will be providing the live setlist reports. Can't thank him enough! I'm also looking for backup tonight, in case of bad connection, battery issues, etc, so if you can help, I'd really appreciate it. Email me at craigatcof (at) gmail (dot) com or @CraigatCoF on Twitter. Thanks! At this point you pretty much know what you'll be hearing tonight (or do you? ), so no worries over what might be or could be, just go and enjoy every single second! These are very special shows, and if you are lucky enough to attend, you should savor every single song. Hell, just sing and dance until you can't sing and dance any more. Just have a blast! Thank you to The Cure, the crew, all of their families, and everyone else involved in giving us all such wonderful shows! A Very Merry and Happy Christmas to you all! Robert: "It used to be easy to decide what to play. People would ask for that dripdripdrip song" Plays intro of 10:15... "This is a Disintegration-type encore - but the happy side of Disintegration. What do you mean 'boo'? Look behind you!" Robert: "Reeves has agreed to pay the curfew fine tonight. Here's the last Top song"
Thanks again to JC/Perfect.Murder for the setlist reports tonight. Changes from Night 1 - added Push, Inbetween Days, Fascination St. Removed Before Three, High, Let's Go To Bed. From Antti: "Another epic night! Bumped into Alison from Cranes during the gig. She is so lovely. " From Journey to the Center of My Record Collection: "Just got to the apollo. 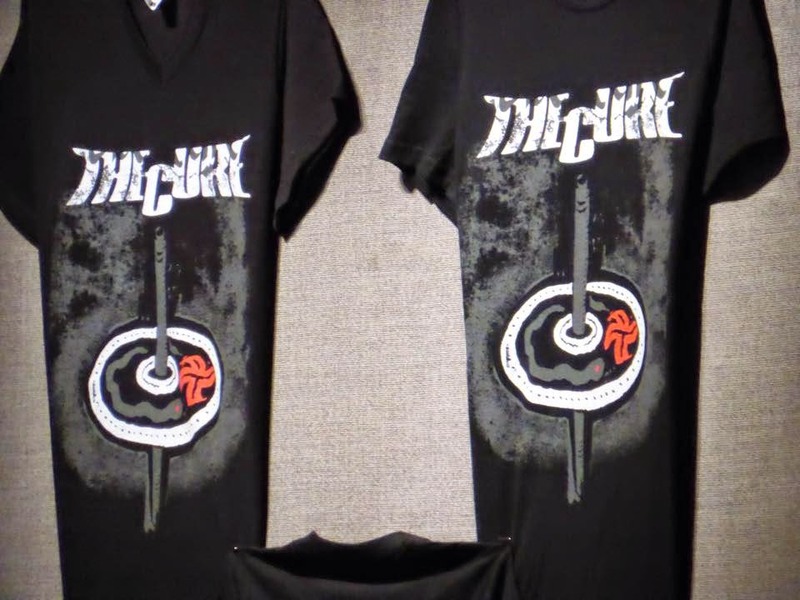 Could see the merch stall through the door and it's the same t shirt as last night so a fair bet that we get a similar set." JC/Perfect.Murder will be providing the live setlist reports again tonight, but for the first time in ages, Olivier will be not be at the show. :( So if anyone would be willing to be backup tonight, I'd really appreciate it. Email me at craigatcof (at) gmail (dot) com or @CraigatCoF on Twitter. Thanks! And don't get all mad and upset if the show is similar to last night. 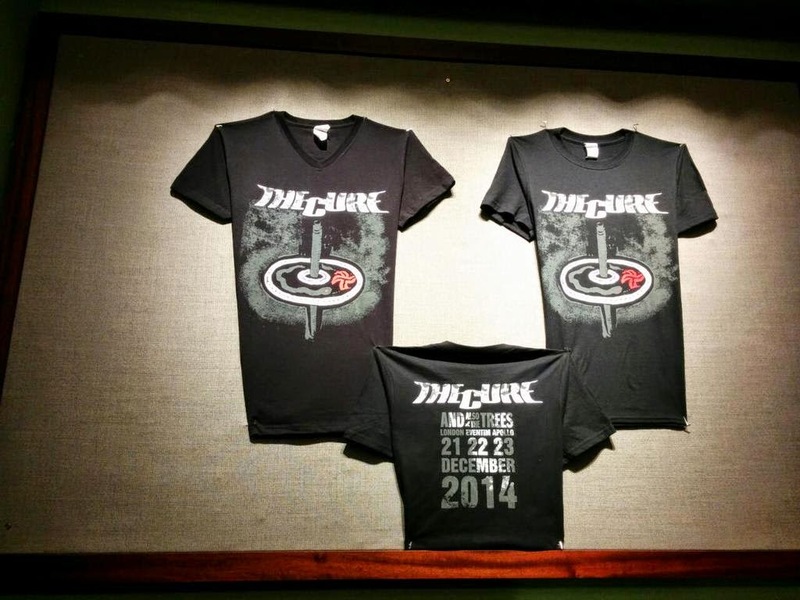 The t-shirts make it very clear (Top artwork, dates for all 3 nights on it) that these are Top 30th anniversary celebration shows, not Trilogy 3. Don't expect Head on the Door in full tonight. Unless you get there and see a HotD t-shirt for sale. :) Would love to be proven wrong, though! Just lower expectations a bit, and don't complain if they don't do HotD tonight, and Kiss Me tomorrow. Have a wonderful time tonight! 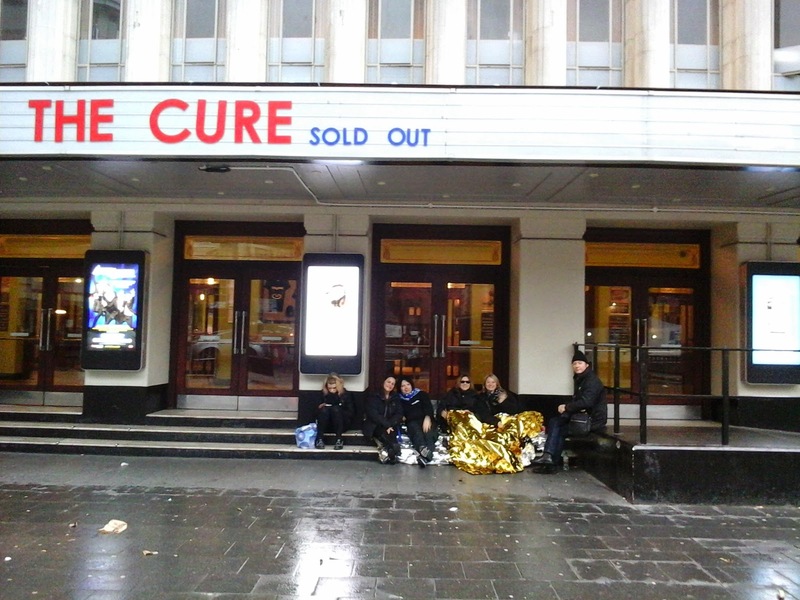 From lalocuramorena: The queue for tonight's Cure show at 10am. From @chriswhite65 - "please warn fans ticket tout/scalpers out side with fake tickets do not buy any." From @JanieBigWeb - "please let everyone know touts selling FAKE tickets outside Hammersmith tonight. Beware." A million thanks to JC/Perfect.Murder and Olivier at it's a perfect day for the updates tonight! JC/Perfect.Murder will be providing the live setlist reports tonight, and Olivier will be posting updates at it's a perfect day (and let's hope he's busy filming lots of rare songs!). And as always, if you'd like to help, please do! Email me at craigatcof (at) gmail (dot) com or @CraigatCoF on Twitter. Thanks! Last time I played Hammersmith was 1987 with the Psychedelic Furs little did I know that 6 weeks later I would be asked to join The Cure. ... and that 27 years later we would still all be together and playing. I have the feeling tonight is going to be one of the great shows! And some more shots from Andreas at cure-concerts.de. And close-ups of the badges here. Roger O'Donnell's MT8 releases from The Truth In Me and Songs From The Silver Box, each song delivered as eight synchronized stereo tracks in a mixer format. You can solo, mute, and adjust the volume on every instrument and vocal track! Only with the MultiTracks App for iPhone, iPad and iPod Touch.